« You Can Have YourTube! If I can remember a bike ride after 30 years of riding, it makes my life list. Painful rides come to mind too, but those are best forgotten. 1. Rolle Pass, Italy, 1985. It’s really hard to pick a winner, but the image of Rolle Pass with its sedimentary carbonate edifice soaring skyward, is burned into my mind. The Dolomites rock! (so the speak). It was a 94-mile ride through spectacular Italian countryside. 2. Gavia Pass, Italy, 1985. On the second day of riding in Italy (100 miles the previous day) I rode over Gavia Pass. I was riding a 42/21 gear, so it’s not hard to imagine what this was like in the sections with 14 percent. However, this dirt road (now paved) had become legendary among Bay Area cyclists who saw a poster of Jobst Brandt riding the pass. It was everything I had imagined, and more. A beautiful day capped off by a fantastic hotel/dinner in Bormio. 3. Corn Roast, 1981. A ride from Palo Alto to Big Basin State Park, Last Chance Road, Swanton Road. We stopped to enjoy the annual Swanton bluegrass festival, complete with live music, and lots of delicious food — burritos, corn, beer. On the way back, we dipped our burning feet in Waddell Creek off Last Chance Road. A great way to cool off on a hot summer day. 4. Gazos Creek Road, 1982. We headed out to Big Basin State Park to check out Gazos Creek Road. After a winter of torrential rain, the road was wiped off the map. We clambered over redwood trees for at least a half-mile. We had beautiful weather that day. 5. New Idria, 2005. I’ve ridden just about every road in the Bay Area, but New Idria opened new horizons. It’s south of Hollister, so not exactly Bay Area. This ride involved fording San Benito River, climbing to 4,500 feet on a dirt road, passing New Idria Mine and returning through Panoche Valley, one of the seven wonders of Central California. Open Space! 6. Mt. Evans , 1980. Scott Morson and I started in Bergen Park and rode up Highway 103, Squaw Pass Road. The real altitude burn begins at Echo Lake to the top, 14 miles. Summit altitude – 14,100 feet (road). From the summit you can see forever, if it’s clear. We went in September when it can be nice, but we ran into a fog bank and then it rained. Bring gloves. 7. 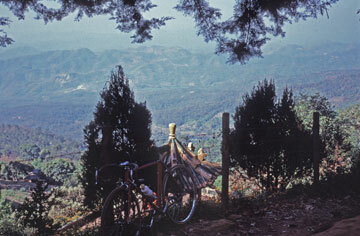 Doi Suthep, Thailand, 1989. It’s one of the more enjoyable rides in Thailand: Chiang Mai to the King’s Summer Palace on Doi Suthep. I continued on a dirt road to the Doi Pui village nearby. An opium museum and fields of poppies await. They drive/ride on the left in Thailand. 8. Mt. Hamilton, 1982. That spring the flower display in San Antonio Valley put on a show, the likes of which we may never see again. Fabulous! 9. Crested Butte, 1985. We took a train to Grand Junction, then got a ride to the mountain bike gathering taking place in September. Some of the best scenery and mountain bike riding anywhere in the world. 10. Mt. Tamalpais, 1981. It was my first ride up the old railroad grade. We continued to Olema and then over to the dirt coast road through Pt. Reyes National Seashore along the Pacific Ocean (off limits to bikes now) to Bolinas and then back to San Francisco over the Golden Gate Bridge. This entry was posted on March 8, 2009 at 10:04 pm and is filed under Ride reports. You can follow any responses to this entry through the RSS 2.0 feed. You can leave a response, or trackback from your own site.